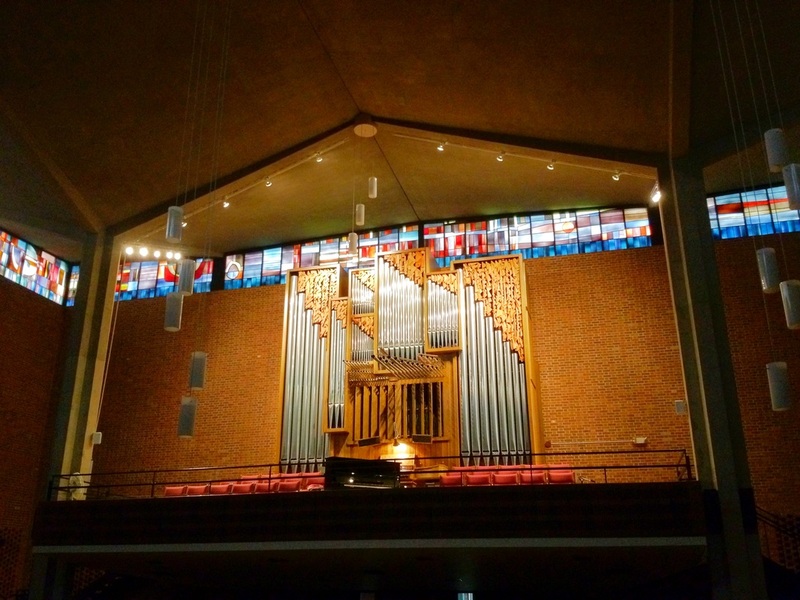 The organ in Christ Chapel was installed when the Chapel was built in 1962. It was contracted through Byron Arneson from Hillgreen-Lane. This is the largest instrument they ever produced. 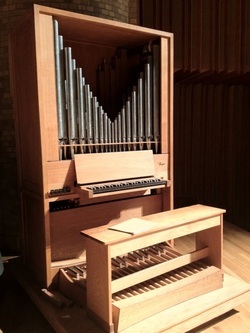 For specifications of the current organ, click here. For specifications of the 1962 organ, click here. Gustavus Adolphus College has three practice instruments. One was built by Reiger Orgelbau in 1976 (pictured). 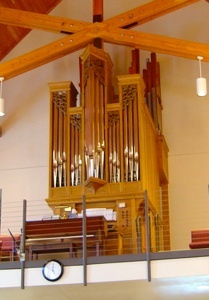 A second was built by the Hendrickson Organ Company in 1977. Newly added is a 8 rank Van Daalen, circa 1978. For specifications of these organs, click here. 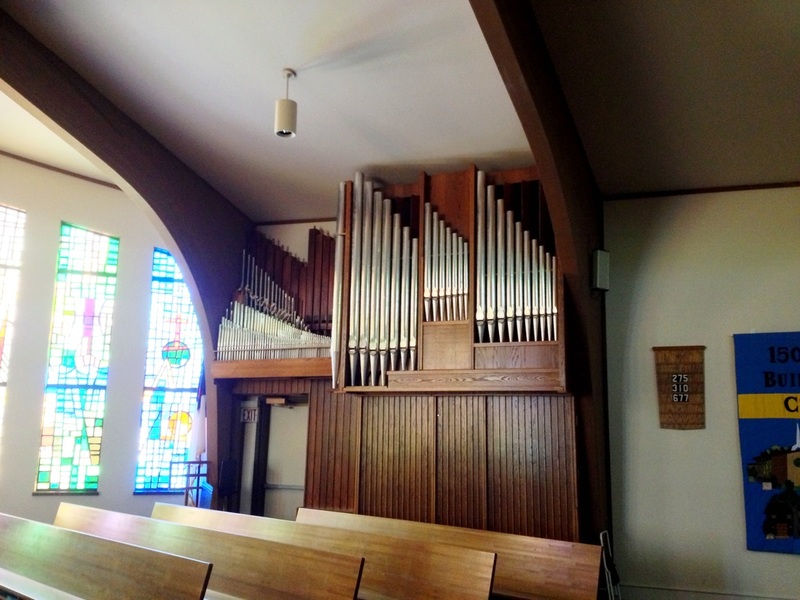 This organ was built by the Noack Organ Company in 1976. 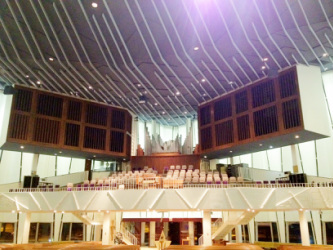 After the damage to the original Church of St. Peter by the 1998 tornado, the 1981 opus 53 Hendrickson pipe organ was removed and saved. The church was demolished, and a new church/school facility built a mile away. 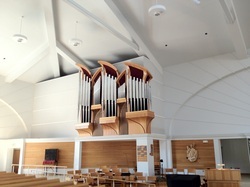 The organ was revised, enlarged to 3-manuals 40 ranks, and installed in the new church in the Spring of 2001. The facade was designed by Andreas Hendrickson, who also supervised its construction and installation. Those 1981 facade pipes, which were undamaged after the tornado, were retained and revised into the new facade. 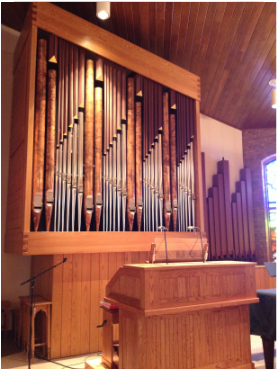 This 34 rank pipe organ was built in 1979 for First Lutheran Church (ELCA) in St. Peter. This 10 rank organ was built in 1996. The original organ at St. Peter Lutheran was a small Wangerin in a front left chamber behind a velvet drape, built in the early years of the 20th Century. When the tremolo was on the drape shook violently. The organ looks odd in its new setting since it is so narrow and deep. It was designed to fit in a chamber, which is why it looks so narrow. The pedal division sticks up behind and above the main case since it was reconfigured to provide the passage beneath. Nonetheless, it sounds infinitely better in the new acoustic than it did in the old and dead sanctuary. The sound is so improved that it's hard to imagine that it's the same organ. 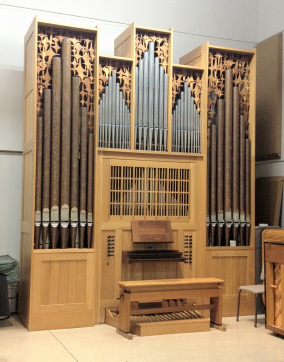 This 23 rank organ was built in 1987. This 14 rank organ was built in 1989-1990. 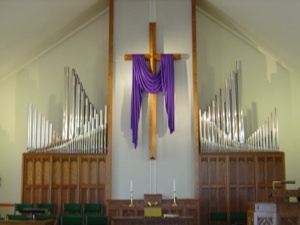 It replaced a Moller organ that was not big enough for the new sanctuary. 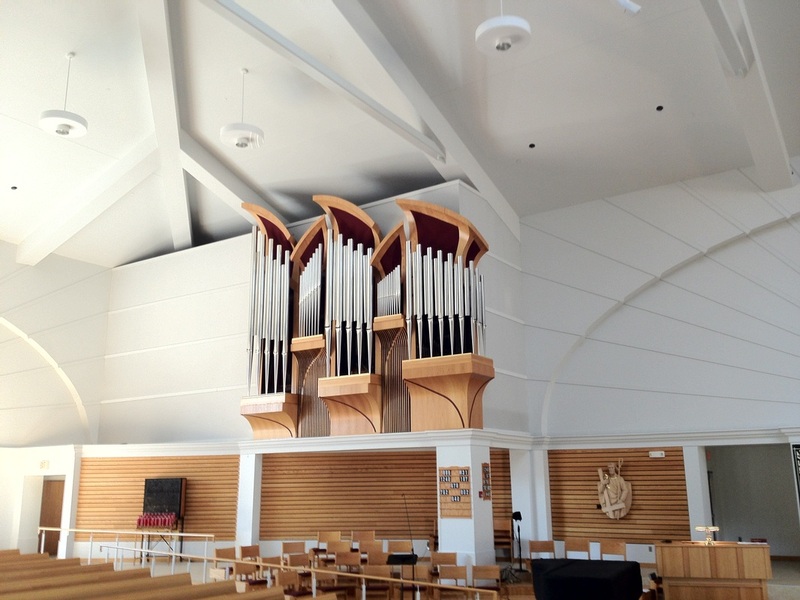 This 10 rank organ was built in the 1980s.